I really like Read, Write, Think's Acrostic Poem Generator. It is not 100% ideal for grade two but its positives out way the hurdles. Open Read Write Think's Acrostic Poem Generator on the Smartboard. 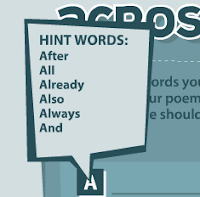 Click "see answer" to the question What is an Acrostic Poem? and read the answer together. 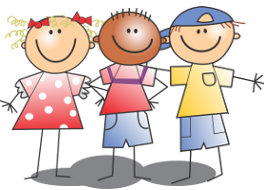 (I have a class website so I put the link to the activity there). We reviewed they only put their first name on activities on the internet when the prompt for "your name" comes up. Together we brainstormed eight keywords/ideas for Valentine's Day. Then I showed the students my favourite feature - when you mouse over any of the letters in the title/topic of your acrostic, the program provides hint words. Using the hint words and our brainstorm words (which are visible while you write the acrostic, too) we wrote a poem. When we were finished, I modelled how to save it. During the first week of centres a few hiccups arose in my students ability to do this independently. As they did not do their centres on the same day we did the model lesson, their braintorm list was full of spelling errors and therefore so were their poems. More importantly, however, my struggling students spent A LOT of time on the brainstorm part of the activity. Saved final copies are PDF. Saved incomplete copies allow students to open and continue to work on their project. How is this a problem? Well, I noticed one student spelled their topic word HAERT and another spelled it HEEART (despite having the words on my website and on the whiteboard). However, we could not edit them as they had saved their poems as PDFs there were no working files saved to allow for editing. I do not believe in one-offs for most activities. I think its ideal to have students do an activity a number of times. Therefore, I wanted to add this acrostic activity in my centre rotation. To do so, however, I needed to make some changes. I followed much the same lesson plan as I did the first time I introduced the centre. I did another model lesson. Open Read Write Think's Acrostic Poem Generator on the Smartboard. I told them they would have a choice between two words: love and hockey. Together we brainstormed keywords/ideas for hockey on chart paper. We did the same for love. These charts were then posted during centre time each day for students to reference. 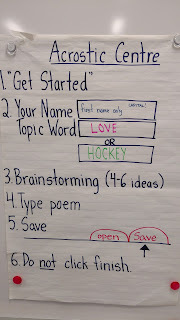 Then I reviewed the students my favourite feature - when you mouse over any of the letters in the title/topic of your acrostic, the program provides suggestions for words. 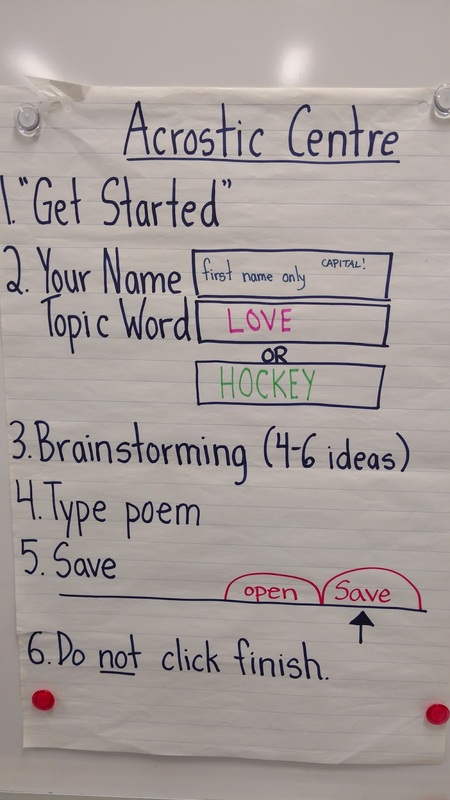 Using the hint words and our brainstorm words (which are visible while you write the acrostic, too) we wrote a hockey poem. When we were finished, I modelled how to save it as a RWT file only. Students were told not to save it as a final copy. All these steps and hints were written on chart paper and then posted during centre time each day for students to reference. During the second week, I had students who were finished their final copy, leave their Chromebooks logged on for me at lunch. I opened up their file (you have to go to the Acrostic Generator and open it from there) and saved it as a final and emailed it to myself. For those poems that needed edits, I had student make corrections at another time before I emailed the poems to myself. As most of the edits were minor, this was easy to do during class. Once I had all the PDFs, I simply printed them from my computer.